Netvouchercodes.co.uk asked me to put together some items from brands they do vouchers for, so I decided to put together a little collection of things I would take with me to the upcoming festivals. I know the prints are a little crazy, but diluted with a plainer outfit or accessories I think they'd look very cool. Its no secret I love wearing playsuits - they're much more comfortable than dresses and means that I'm not constantly worried about the wind blowing my skirt up. The Marylin look isn't very me. You can tell I was being a little optimistic with the footwear. White sneakers to a muddy festival? Am I joking? If its really warm (and sometimes, festivals can get baking) the fields will be dry and then I'll be thankful to a nice pair of shoes to keep my feet comfortable throughout the day. Wellies are brilliant, but wear them too many days in a row and your feet will never look the same again. 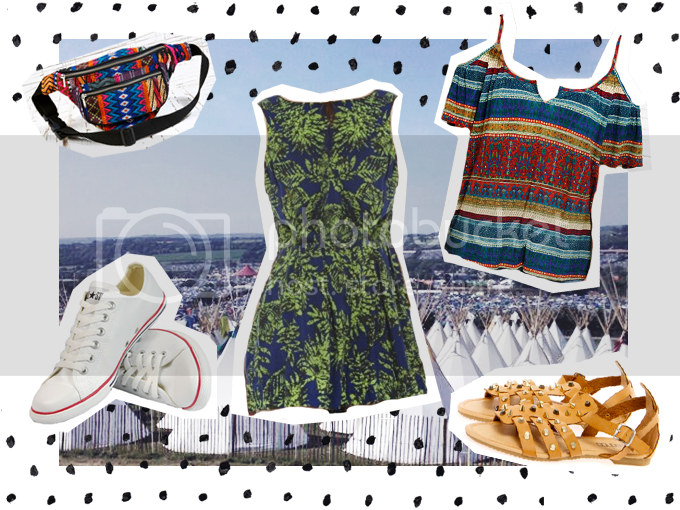 Whats on your wishlist for upcoming festivals? Written in association with netvouchercodes.co.uk. All opinions are my own. Completely off topic but your blog/photo layouts are phenomenal! They've really inspired me to experiment more with Photoshop. Anyway back to your post, I adore everything you've chosen. Unfortunately I'm not off to any festivals this summer so I don't have a wishlist! Crazy prints are all the rage now. I'd totally wear these. Liking the flats too. Thank you :) I'm glad you like them! Aren't they just? I love them but I really do think I can only wear one crazy printed thing at a time.